Environmental toxins are unavoidable. The U.S. Environmental Protection Agency sets acceptable levels of dozens of compounds and chemicals, including arsenic and lead, that can be present in the air we breathe and the water we drink. Preservatives and artificial colors and flavors made from petrochemicals are present in many of the foods we eat every day. The 21-day juice diet is designed to help your body rid itself of these environmental toxins. 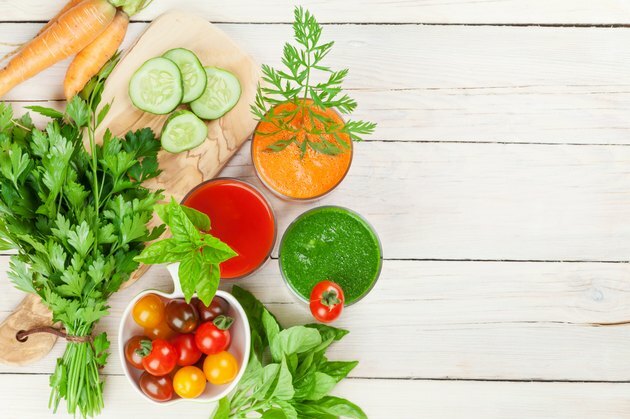 The idea behind the 21-day juice diet is that the toxins that build up in your body prevent it from efficiently metabolizing the nutrients in your food. The 21-day juice diet is designed to remove those toxins and adequately nourish your body at the same time. Phase one of the 21-day juice diet lasts for eight consecutive days. In phase one, you should consume nothing but freshly made fruit and vegetable juice and water. It is essential that you make your own juices at home to get the most nutritional value from the vegetables and fruits. Most people dilute their juice with equal parts juice and filtered water. Others drink 8 oz. of juice followed by 8 oz. of water. It is essential to give your body time to adjust to solid foods after more than a week on a liquid diet. The three days of phase two are designed to do just that. In phase two, you eat a variety of light foods such as vegetable soups and fruits. Eat half as much food as you want, but eat twice as often. For example, instead of eating three large meals per day you would eat six smaller meals. This eases your body back into digesting solid foods. In phase three, 75 percent of your food should be fresh and raw. Begin each meal with a large salad or several pieces of raw fruit or vegetables. You should avoid meat and poultry. Fish is acceptable, although you should avoid fried or breaded preparations. Always speak with your doctor before making radical changes to your diet. A juice fast may not be appropriate if you are pregnant, nursing or undergoing medical treatment. According to Katherine Zeratsky, R.D., L.D., nutritionist at the Mayo Clinic, there is little scientific evidence to support detox diets such as the 21-day juice diet, and they can have side effects including dizziness, nausea and dehydration. Your doctor will review your diet plan to ensure that you receive enough calories, protein, calcium and other nutrients while on the diet.